It's that time of year again. The wineberries that grow wild all over our land are now ripe. Wineberries are similar to a raspberry in size and color, but have seeds like a blackberry. Paul spent several hours picking berries. Then I sterilized everything and made some jam. Nothing quite so satisfying as the sound of the lids popping as they seal. If I can find the time, I'll do another batch. I love to use the jam as gifts, and I think it's fun that the berries come from our own land. Readers, what is your favorite flavor of jam? Gorgeous color! I bet it tastes heavenly! I bet it is delicious. Wait! I think I might have gotten to try a jar. I bet wineberries are delicious. I've never heard of them before, but I do like raspberries and blackberries. (My daughter would approve of your jam. It drives her nuts when people remove all the seeds, or chunks of any kind, and then call it jam.) I love just about any type of fruit jam. But I have a soft spot in my heart for plum jam, because my grandmother used to make it. Wineberries....yumm! My all time favorite is Black Raspberry! I have never had a wineberry but I bet I would like them.. I like any berry. I have never even heard of wineberries! It looks so pretty--such a lovely color. I love blackberry and strawberry jams. I remember that popping sound when my mother canned when I was growing up. You're right about that lid popping being SUCH a satisfying sound! Those look wonderful! I have to get out and pick mulberries this weekend. It is a job! I bet this is good!! I love any kind, I think raspberry is my fave. I won't be making Raspberry jam this year. The rabbits thinned out our patch. Just enough to eat. We have wineberries too. I can almost eat my weight in the darned things! I love them. I've always been crazy for raspberries, but I like these better. Why do they always grow smack dab in the middle of poison ivy? Murphy's Law! Girl I am so proud of you! I can't do that. I actually love orange marmelade, not so much other flavors. We have a lot of blackberries here that I freeze. I would love to try your wineberries! Never heard of them! Yes! 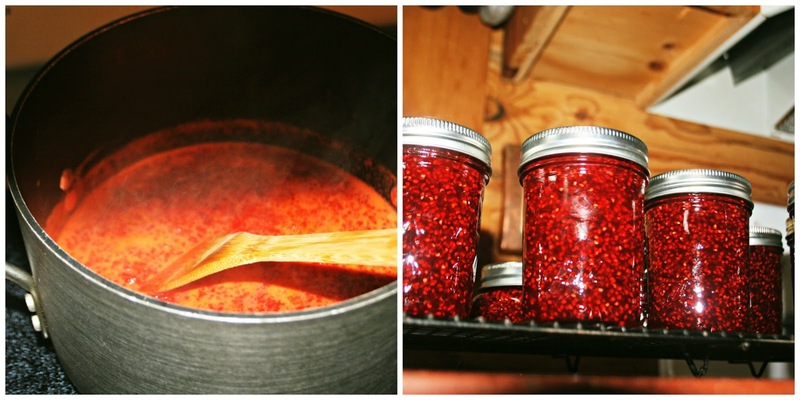 Homemade jam made with your home grown berries = best gift ever. My favorite kind is blackberry. Whenever i eat it, it reminds me of my grandmother, who was a jam making dynamo! Mmm sound so yummy. I love homemade jam. I bet your boys do too. Oh yum, and we know how wonderful your kitchen must smell too! I can't imagine how much you picked to make jam. That's hard work right there! My mother makes all kind of jams, I'm actually gonna carry a couple of jars over to Finland when I get back next week! I've never heard of wineberries. The color is gorgeous! Do they taste like any other berry?